Your Facebook News Feed is like a newspaper centered around your friends. Look below the Share menu on your Home page to see the News Feed column, divided into two sections: Top Stories and Recent Stories. Top Stories and Recent Stories are two different sides of the same News Feed coin. Think about Top Stories as the front page of your newspaper: It’s the most important stuff (well, what Facebook thinks you’ll find most important). Top Stories is sorted by a whole bunch of different factors. One of them is your relationship with a particular friend. A story from your mom might be considered more important than a story from that guy you met that one time at that place. Top Stories are easily recognizable by their upper-left corner, which is blue. Clicking this blue corner removes Top Story status. Inversely, you can assign Top Story status by hovering over the upper left of a Recent Story and clicking the blue corner when it appears. 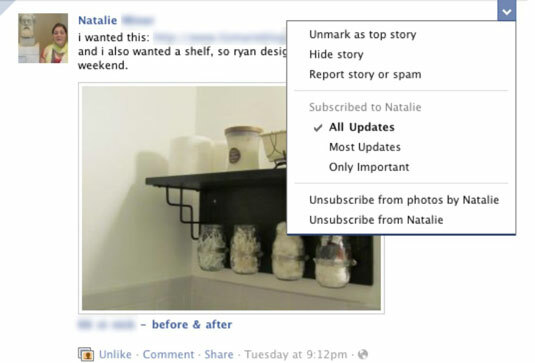 Changing the status of a News Feed story tells Facebook which story types you want to see more or less of in the future. Recent Stories shows you stories based entirely on what has happened most recently. The newest stories are at the top and, as you scroll down, you’ll see older and older stories. Most Recent doesn’t usually show you all the stories from everyone, but it does show you more than Top Stories. Depending on how long it’s been since you’ve last logged in, Facebook may default you to Recent Stories instead of Top Stories. If you’ve been gone for a day, chances are you’ll see Top Stories when you first log in. You’ll never have to worry about missing important news again. The easiest way to influence News Feed is to let it know when you don’t Like a post. Whenever you hover over a particular story, a small icon resembling a lowercase letter v, called a caron, appears in its upper-right corner. Clicking the caron reveals a menu that lets you do all sorts of things, like hide a story or report it as spam.